I would like to whisk us off to Sweden for a moment, where the artist behind our #6 top single of 2014 resides. 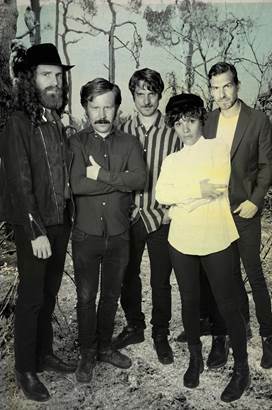 Amason is a quintet comprised of busy musicians, almost all of them associated with other projects, including Dungen, Idiot Wind, and Miike Snow. They’ve pooled their talents for Amason’s debut EP, but “Duvan” is the first taste we’ve gotten of their upcoming album, Sky City. This is what indie rock should be. The upbeat tempo drives you through the song, but the lead vocals and notable whoo-hoos from Amanda Bergman are gripping. I also am partial to lyrics that don’t make sense, which I think Amason delivers fairly well here. I get the sense that this is a song about a relationship (aren’t they all? ), but specifics are beyond me. Well done. Amason released an EP last year with five songs that have somehow placated their fan base until now. They released the tracklist for their upcoming LP, and the only duplicate tracks from the EP are “Älgen” and “Went to War,” so I am excited to hear the other 9 new tracks (not including “Duvan”). I have listened to “Duvan” at least 100 times, and I still love it; if the whole album holds up as well as that single does, then Amason may have a top album of 2015 on their hands. For now, though, “Duvan” will have to stick with being a top track of 2014. Sky City will be out 1/27 on Fairfax Recordings. Find more information on Amason on their website, Facebook, Twitter, and Soundcloud.